When you’re in charge of housing onsite employees, there’s a fine line to walk between budgetary demands and residential comforts. Inadequate living space can affect productivity, morale, even turnover rates. On the other hand, pumping cash into an elaborate, permanent infrastructure is a risky investment—one you can’t recoup when your project’s lifecycle stops cold. 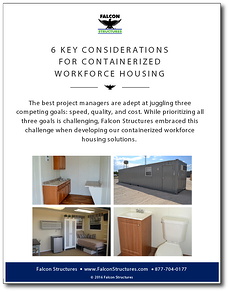 If you’re looking to improve your onsite operations, read our guide, "6 Key Considerations for Workforce Housing." You’ll find that shipping container homes meet all the typical benchmarks for temporary housing… while surpassing the alternatives in terms of speed, security, weather safety, and more. ISO shipping containers are equipped to handle all your biggest weather challenges. Also known as Conex boxes, these units are often among the few structures to survive hurricanes and tornadoes. At Falcon, we’re also experienced in providing climate-controlled workforce housing. Modified conex containers can be customized with high-grade insulation and superior temperature controls for projects anchored in hot, cold, or humid climate zones. Shipping container homes can be modified and delivered faster than the alternatives because shipping containers are already built. Tens of thousands of these marine-grade Conex boxes are waiting to be recycled, so you’ll never be stuck waiting on an out-of-stock model. Whether you need three or 37 container homes, Falcon has developed a streamlined process for incorporating plumbing and electrical hookups, along with any specific modifications you may request. And Living Boxes are easily plotted on any flat surface; no foundation is required. Security is sometimes overlooked as being a key challenge in workforce housing and disaster relief camps. But thefts and assaults are an unfortunate reality for many onsite coordinators. You can be proactive about your site’s security measures by choosing Falcon living containers, which are standard-equipped with 16-gauge steel exteriors and heavy-duty cargo doors. Units can be customized with lockable window shutter systems, burglar bars, and lockboxes for both entries.